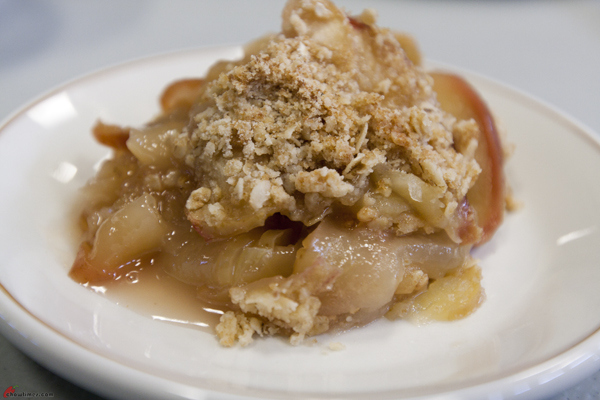 For dessert, Minoo prepared a Gingered Rhubarb Apple Crisp for the South Arm Community Kitchen. Rhubarb is in season at this time of the year. This Gingered Rhubarb Apple Crisp is bursting with ginger flavour. This will be perfect if served with a scoop of vanilla ice-cream. 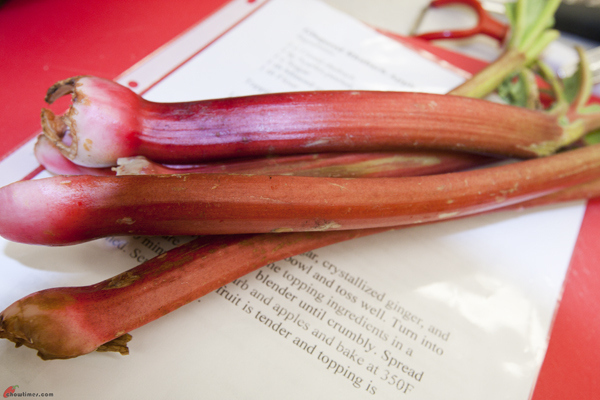 Rhubarb is low in saturated fat, cholesterol and sodium. It is high in dietary fiber, Vitamin C, Vitamin K, Calcium, Potassium, Manganese and Magnesium. Rhubarb is good for maintaining general good health and weight lost diet. Actually, we had a double dessert day. Peggy also demonstrated a Mango Pudding dessert which I had blogged about here. 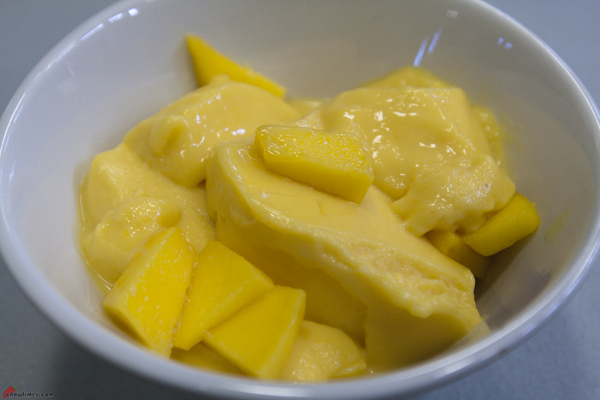 Since the mango pudding needs time to refrigerate to set, Peggy prepared one at home so that we can enjoy it here. We also got to bring home some which Peggy demonstrated in the kitchen. Peggy, thank you for sharing. Core and thinly slice the apple with skin on. 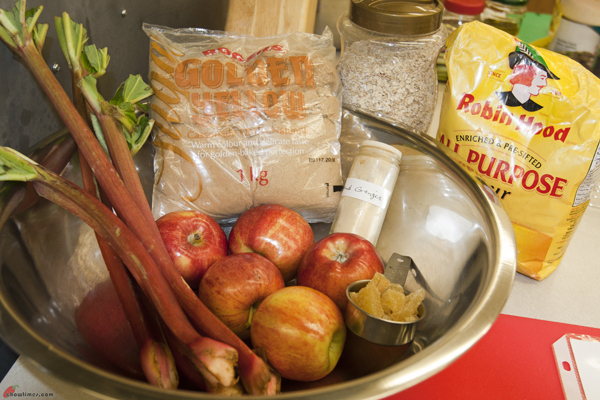 Place rhubarb and apples in a large bowl. 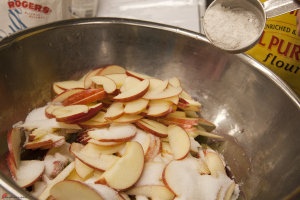 Add sugar and toss to coat well. Add flour and toss well. 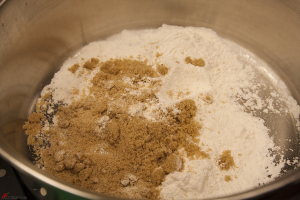 To make the topping, combine flour and brown sugar in a medium bowl. Cut the cold butter into chunks. 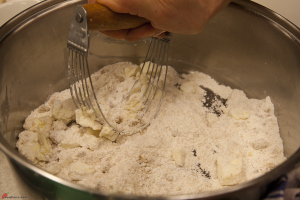 Break the cold butter into the flour and sugar mixture. 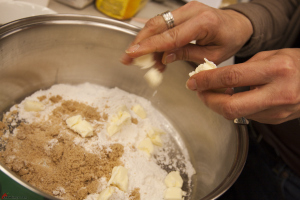 Use a pastry blender to cut butter until crumbly or you can use your fingers to crumble the butter. 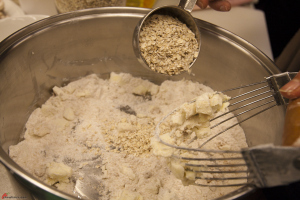 We left out the oatmeal which should go into the flour and sugar mixture. We added the oatmeal here and toss again. 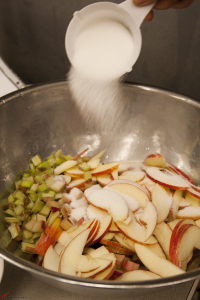 Turn the apple and rhubarb mixture into a greased 9″pie pan. 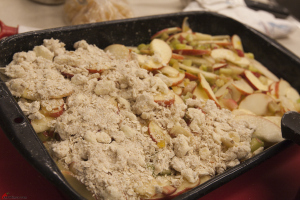 Spread crumb mixture over rhubarb and apples. 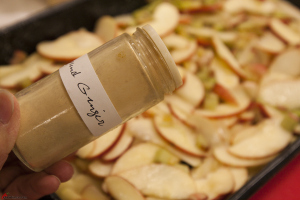 Bake in a 350F preheated oven for 45 to 50 minutes, or until fruit is tender and topping is browned. When I was in high school I learn of rhubard and teacher told all that the leaves are poison to eat so that what it sold without leaves on it. Watch a PBS cooking show Scanidid cooking chef told to add leaves of rhubarb in dish which shock me of it. Sometime cooking show host like Ming Tsai also made a mistake in tofu show. He kept on telling many recipe use silken tofu which I look closer at tv it not silken but regular tofu. Silken tofu it too soft for those he made. So sometime you must know the right way in the recipe yourself when learning it.